Pure Style Home: Pure Projects #13: Finally Hang it! Pure Projects #13: Finally Hang it! I love how a change can make you more aware of a room's goodness. So, the project for this week is to finally get around to hanging something you've been meaning to hang. (If you haven't procrastinated hanging anything like I have, then this week is a freebie for you! ;) But, if you have a special piece of artwork you've been meaning to frame and hang, or a group of family photos you've been planning to get up on the wall, go ahead & do it. 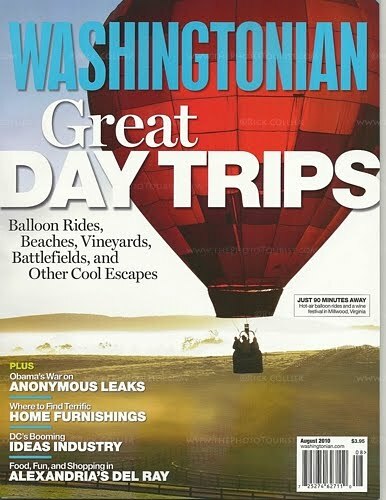 Also, If you're in the area, check out the August issue of Washingtonian Magazine! Jennifer Sergent included me (along with my friend Jill Sorensen) in an article she did and there's a photo of Christian's bedroom in there! And, if you didn't enter the Saffron Marigold giveaway, you can enter it out here. It looks great Lauren. The chart is wonderful! You guys look so swwet together on the bed. I love the chunky black frames that coordinate with the black framed bed! This was the icing on the cake! I am so in love with Christians room! that is seriously very cool. The chart is awesome! Great find! Your project challenge this week is a good one for me. Now if I could just get moving on it! Perfect in there. I'm curious if you scored that on Etsy. I have a friend with a fab. vintage shop on there and that is just the type of stuff she sells. The rooms looks great. Such a fun and great room for a child. I saw your guest post on Right Bank and hopped over here. I love Christian's room. I love the different patterns used and the colours are beautiful! I love the fish poster! You are so right, while cleaning and trimming our atrium I realized that a mobile fountain that is currently on our patio would actually look better and we could hear it better if I moved it to our atrium...I marvel at how a simple change can help you appreciate a room! The room is absolutely adorable. Love the way you used all the fresh bright colors. Easily changed as he gets older without starting all over. Great job! PS I have the post up with my new black cushions with white piping on my porch, I think you will like it, I am in love!! I am so jealous of that fish map!! I have a map hanging in my laundry room but it's no where near as nice and graphic as this... wow, what a find! Congrats on the feature in the magazine! That is a SWEET room! Love the bright colors, very fun and clean looking. Really like the old, red bookshelf AND I completely agree...when you "redo" a room and it looks so pleasant, it makes everyone want to just sit and enjoy the room. Yay for redo's! I've always loved Christian's room. Love the fish! I linked to my pelmet project from last week. I've had that stuff forever and finally, finally got it done and hung!! WooHoo it feels good to cross things off the list. lauren, pure genius! the chart topped it all; the fab drapes (crazy for that print), the color combo, the closet door........amazing! congrats on all the publicity, your star is rising dear friend, as it should! I love all the green and black in the room. The fish chart is beautiful. What a fun room. This room is so much fun! I love the fish chart and my favorite is the closet doors. You did an amazing job! Lauren, I love that German fish poster. Just perfect in every way. You inspired me by your link-up party. I've never participated in one before, but I needed this push to get my family photos on the wall! I finally did it! Yeah! Wow, that fish is awesome. I would hang that anywhere in my house. I'm sure he loves it. I love the colors--especially the red bookshelf. Beautiful. I'm going to talk to Victoria about linking a post up for your "finally hang it" project. We have been working at her new house and it is a slow process and we are also both procrastinators. If we can get something together, we just might. That closet door never fails to make me smile! I did it! I hung something:) check it out! WOW! What a beautiful place you have. The colors so perfect, love it. Christian's room is so nice and I love the addition of the fish chart. What a really neat piece! I just linked to this post - my hallway frames are finally up - now I just have to fill them! It is so nice to finally be using all of the frames and misc. items I have been collecting. Where did you get the green quilt and curtains? are they homemade? I'm redoing my toddler's room and want some basic, fresh fabrics like those! Just posted my project on my blog thanks for the motivation. Fun projects...keep them coming. Love it.